Trace circuits to detect appropriate breaker. Turning off the correct breaker is critical when considering work on an electrical circuit and can take an excessive amount of time. 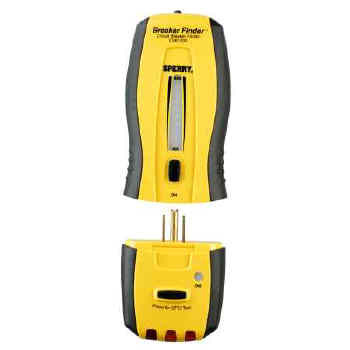 The Breaker Finder is an integrated tool used to correctly identify the right breaker every time. The signal is generated by a plug style tool that also verifies the correct wiring of outlets and includes GFCI test functionality. The patented probe design indicates the signal strength through both and audio tone and visual strength indication. Magnets located on the tester allow for easy placement and operation. The nested design of the tone generator means that the units will not be separated during transport or storage.